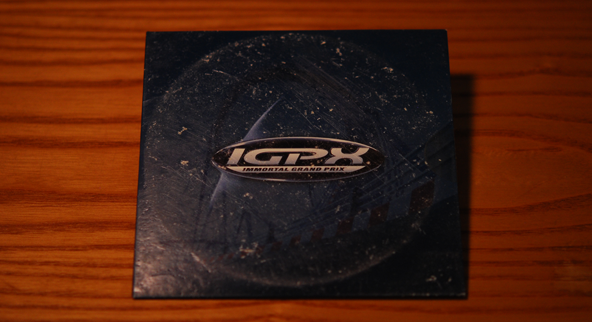 Before IGPX launched on Toonami originally, Cartoon Network sent out preview DVDs with copies of Nintendo Power containing the complete first episode and the extended trailer. I must admit, until recently, I never even opened it, let alone watched it. Now feels like a good time to take a look at what this show is about. If anyone from Toonami is reading this, I'm sorry for the condition of this case. IGPX is a show about the Immortal Grand Prix, a team racing sport where teams pilot robotic racing vehicles that are able to fight as well as race. Think of it as NASCAR mixed with Gundam. The show focuses around Team Satomi, an up-and-coming racing team that just won the IG2 championship. By doing so, they advanced to IG1 league, where they have to race against the top ranked teams the organization has to offer. The first episode is devoted more to introducing the racers rather than the races themselves, but I like what I see. Team Satomi seems like an interesting group of people and I can see some real potential in terms of storyline. In addition, I really like the variety displayed in the different teams. It’s hard to tell, but it looks like the show is going to have a good mix of people. While the first episode didn’t focus too much on it, the trailer showed a great deal of the racing contained in the show. Visually, the racing footage looks great from what I’ve seen. The racing scenes are created in 3D animation and they look great. Productions I.G. has a history of great looking 3D animation and IGPX is no exception. I expect plenty of exciting race scenes in future episodes. Overall, I’m looking forward to watching the remainder of IGPX. It’s a series I’ve been meaning to watch for a while now but obtaining the DVDs isn’t an easy endeavor. Assuming you can even find them, certain volumes can be rather expensive. Again, this is assuming you can find them being sold at all. Finally, the reason I’m eager to watch this show is because we’ll probably never see another show like it. This show’s characters and story was crafted by both Cartoon Network and Productions I.G. though the friendship the staff created together. We’ll probably never see that kind of US/Japan joint project again. So instead I’ll enjoy the one we have. IGPX begins airing on Toonami tonight at 2 a.m. EDT. If you would like to know more about the production of the show, I would suggest listening to episode 43 of the Toonami Faithful podcast; featuring an interview with Jason DeMarco. It’s a great look into the creation of the show.